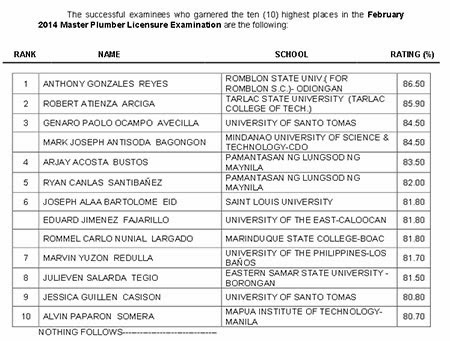 Takers of the Master Plumber Licensure Examinations on February 2014 can now keep this page to view the list of passers. Aside from that, you can also view here the list of topnotchers. 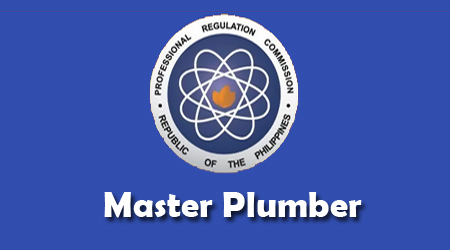 The Professional Regulation Commission and board of Master Plumbing conducted the exam in the city of Manila on February 12 & 13, 2014. Master Plumber Licensure Examinations is conducted twice a year and usually PRC release the results in one working day after the last day of examination. For the meantime, please bookmark it now or visit this site more often for you to be updated. You may also share this post to your friends so they may know about the Master Plumber Board Exam Results. Comments or suggestions about "February 2014: Master Plumber Board Exam Results " is important to us, you may share it by using the comment box below.